The ‘flower garden’ stamp from Darkroom Door performed so well with the random application of colorburst paint I tried it with a more controlled colouring method. I embossed this panel in gold then used Koi colouring brush pens. I decided to colour only the leaves and flowers and leave the tiny circle pattern filler uncoloured. 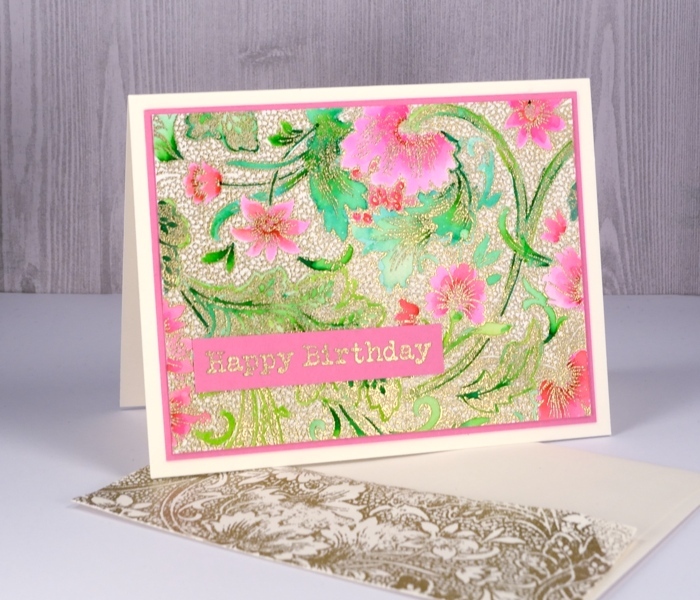 Adding colour to gold embossing like this reminds me very much of Cloisonné which I saw on little trinkets as well as substantial, beautiful vases in China. I used two greens, a pink and a red to colour the design and kept blending with water to create soft gradation of colour. 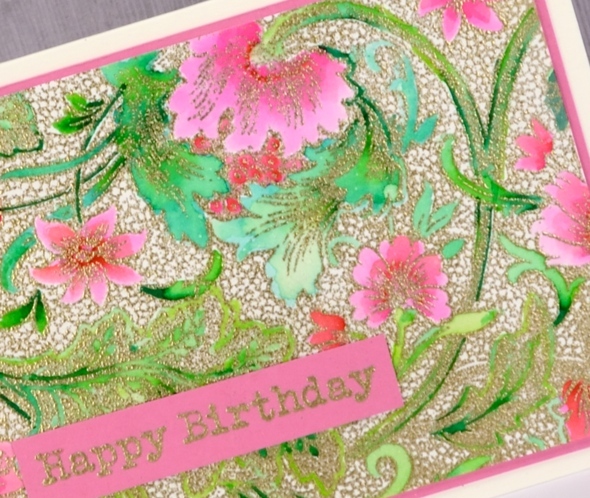 Beautiful and stunning card. I love your work. How beautiful! That is a very lovely stamp. The colors you chose, and your choice to leave the tiny circles background uncolored are perfect! Beautiful, I love the Coisonne look! I absolutely LOVE the cards you have made with this stamp!!! Thank you Mary, I have another one in process with an entirely different look. It really is a stunning stamp.